Diagnose any benign, premalignant, or malignant melanocytic lesion with over 1000 high-quality color images in this practical, easy-to-use reference. Drs. McKee and Calonje—editors of the best-selling dermatopathology reference Pathology of the Skin, 3rd Edition—present their expert knowledge by including diagnostic pearls and pitfalls throughout the text for quick, at-a-glance guidance. Correlate clinical and pathologic findings to produce a more accurate diagnosis from discussions of the clinical manifestations of melanocytic lesions. The format of the text makes this book an excellent resource for bench work and reviewing for exams. Expert Consult functionality allows you to access the entire contents of the book online, from any internet connection. Discusses the clinical manifestations of melanocytic lesions to help you correlate clinical and pathologic findings to produce a more accurate diagnosis. 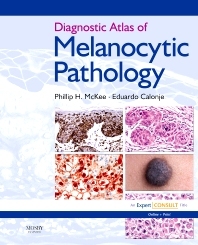 Functions as a unique and invaluable diagnostic resource with over 1,000 full-color photographs to provide you with a visual summary of all the features of melanocytic lesions encountered on a daily basis. Highlights the main pathologic criteria for all commonly seen melanocytic lesions in a concise, user-friendly format so that you get the information you need quickly for immediate problem-solving. Features “diagnostic pearls” and “pitfalls,” particularly emphasizing differential diagnosis, to help you avoid incorrect and inaccurate diagnoses. Presents the fully-searchable text online along with downloadable images for use in your electronic presentations.